European CR-Vs will be built in Japan for Europe. Honda will import the two SUVs it sells in Europe, the CR-V and the HR-V, from Japan to help boost capacity utilization at factories in its its home market. Honda had planned to build the next-generation CR-V compact SUV for Europe in Ontario, Canada, starting in September 2018. The current European model is built in Swindon, England. The Japanese automaker said last November it would focus Ontario production on supplying North American instead of capitalizing on a new free-trade agreement between Canada and the European Union. Future CR-Vs for Europe will be built only in Japan. The automaker also will stop exporting the HR-V subcompact SUV to Europe from Mexico when the model is face-lifted in 2019. Production will move to Yorii, Japan. "It makes sense to fill capacity in our own plants in Japan," Honda’s head of UK operations, David Hodgetts, told Automotive News Europe. Honda has already shifted production of European versions of its Jazz subcompact hatchback to Japan from Swindon and China after it decided to make the Swindon factory the global production hub for the five-door Civic hatchback, exporting the compact car to the U.S. and Japan, as well as EU markets. Its plant in Turkey builds the four-door sedan version for European markets. Honda and other Japanese automakers are addressing the loss of production from falling sales in their home market with more exports, especially of higher-value models, said Masatoshi Nishimoto, Japan/Korea vehicle production forecasts manager for IHS Markit. IHS expects Japanese production of light vehicles to fall below 8.5 million by 2020 from 9.2 million units now. Last year, Japan exported 4.6 million vehicles, according to figures from country’s vehicle manufacturers’ association, JAMA. In 2016, Japan was the biggest exporter of vehicles to the EU by value, figures from the European automakers’ association ACEA show. A total of 577,703 vehicles came from Japan, up 20 percent on the year before. That number is likely to increase after the EU agreed to a trade deal that includes a seven-year phase out of a 10 percent import duty on Japanese cars in return for better access to Japan’s food market. Annual production at Honda’s Swindon factory declined to 119,995 in 2014 from close to its capacity of 250,000 a year in 2008. However, Honda predicts it will build 165,000 vehicles at the plant this year on the back of higher-than-expected demand in the U.S. for the Civic five-door variant. 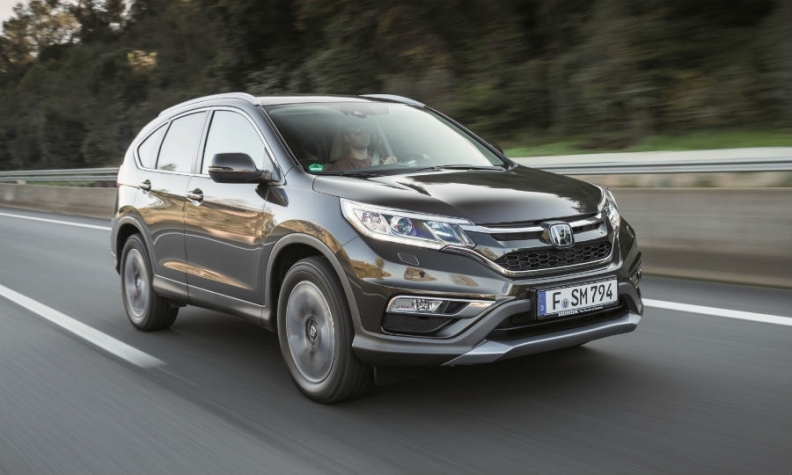 CR-V sales in Europe fell 22 percent to 20,330 in the first five months, according to market researcher JATO Dynamics. HR-V sales were down 7.8 percent to 15,563.